Gun Kutas or gun Milan is there in astrology that is considered significant for marriage. This section of report gives information regarding the points that are obtained from 36 and the impact of this score. Number of websites offers this feature but we conduct a manual analysis and not a computerized one. There are chances of flaws in computerized reports and therefore one cannot rely on the results of these reports. This is the reason why we offer manually analyzed reports for accurate results. 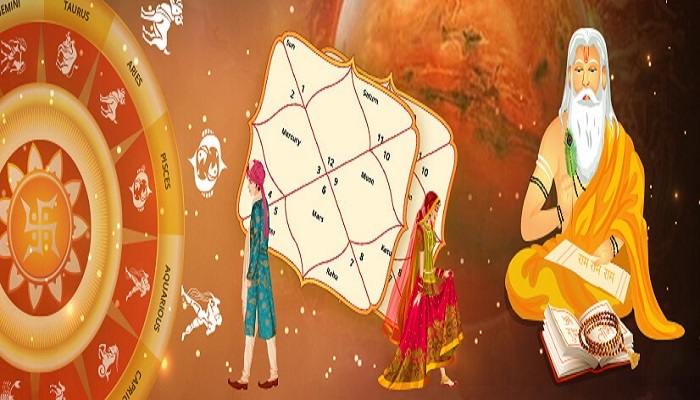 If the married life is having problems, gaps, compatibility issues and any other kind of problem then the reasons might be hidden in the horoscope. In case you are facing problems, we offer verified and tested solutions for the same. For instance, if one of the partner is Manglik while the other one is non manglik then this might impact the health of non manglik one. 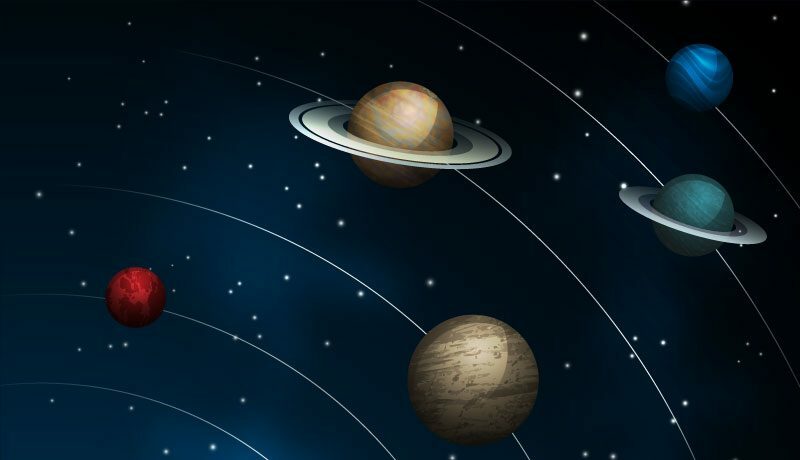 In such cases, the horoscope is analyzed so as to find some solution of the problem. There are certain situations in life when it becomes difficult to live life with each other and the person thinks that the only solution is to get separated or divorce. Horoscope might be a reason for this and in case possibility of separation is there then when we give information about it. With the clear details, one can take proper decision regarding the next step. Several people have received benefits with the help of our readings and in many cases, the condition of divorce has also been avoided. Our report provides information as whether the decision of divorce is a only choice or is there any solution for the problem. Only the details of girl and boy regarding their birth such as time and date of birth are required for the in depth analysis of horoscope. In the period of a week, the report will be provided to the client. Time is required in the process since the report is manual and the results are decisive. 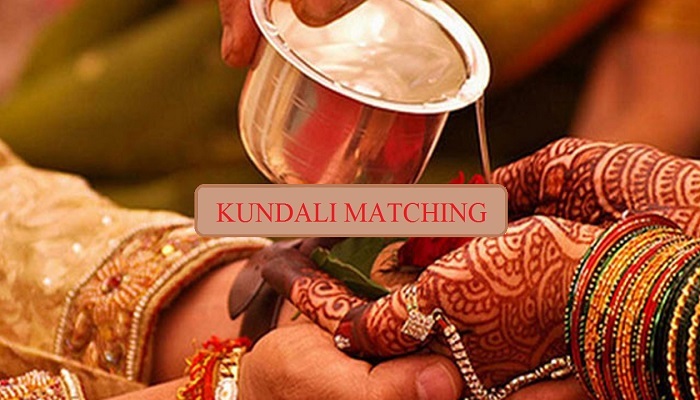 You can rely on the analysis as astrologer Ashok Prajapati conducts thorough study for giving the report of kundali matching. We do not rely on any kind of software since their results might come with faults. This is the case of life of two people and their families and therefore reliable solutions are offered that can solve the issues. Varna/Jaati: Signifies ego levels of girl and boy along with their spiritual compatibility. The categories in which it is divided are Brahmins, Vaishya, Kshatriya, Shudra. Vashya: Signifies power equation, marriage control and attraction amongst couples. 5 types are there in which a person is classified: Human (Nara), (sea animals)Jalchar, (Vanchar) wild animals, small animals (Chatushpad), insects (keet). Dina: Signifies destiny and compatibility of birth chart and are 27 in number. Yoni: The mutual love, sexual compatibility and intimacy level between couple is measured by this. Its classification is done in 14 animals: Elephant, Horse, Snake, Sheep, Cat, Dog, Buffalo, Deer, Tiger, Cow, Lion, Monkey and Mongoose. Graha Maitri: Signifies affection, mental compatibility and friendship. Amongst couples, the compatibility of moon sign is also signified by this. Gana: Based on temperament and behavior. 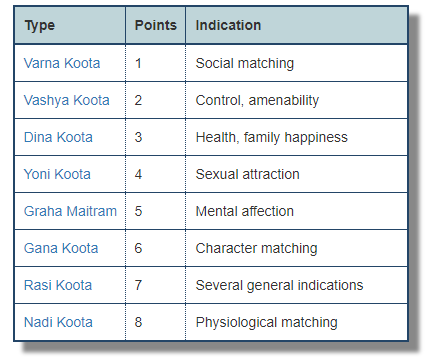 3 categories are there in which birth chart are shared: God (Deva), Human (Manava), Demon (Rakshasa). Rashi: signifies love and emotional compatibility among couple. 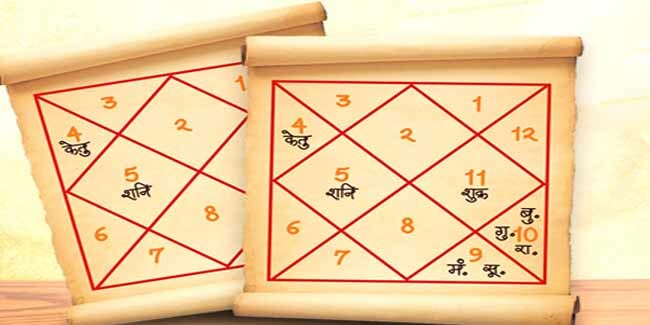 Comparison is done between girl’s and boy’s birth chart and position of moon in house is considered in this. Nadi: Signifies genes and health. 3 parts are there in which stars are categorized: Vata (Aadi) Nadi, Pitta (Madhya) Nadi, Kapha (Antya) Nadi.